Map of Lagomere circa 2E 582. The Lagomere is a region that consists of the central portion of Deshaan. 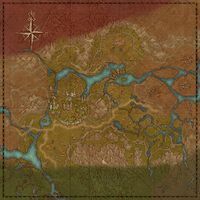 The Lagomere houses the capital of the Great House Indoril, the city-state of Mournhold. The region also houses Lake Amaya as well as several Dwarven ruins such as Bthanual and Mzithumz. Lagomere is where the illustrious school of magic, Shad Astula, which is located in the northernmost reach of the region. The region borders the Redolent Loam to the west, Siltreen to the east, and the Reticulated Spine to the south. This page was last modified on 24 March 2018, at 07:30.